The hunt for the perfect mascara has been one I've pursued since my teens. Most have delivered in one way or another but none quite had the power to do it all...and then I discovered Benefit They're Real! Mascara. They're Real mascara had been on my radar for a while and I know Hannah swears by it so I was one happy girl when a friend gave me a sample she received and then Hannah bought me back a tube from Sydney. 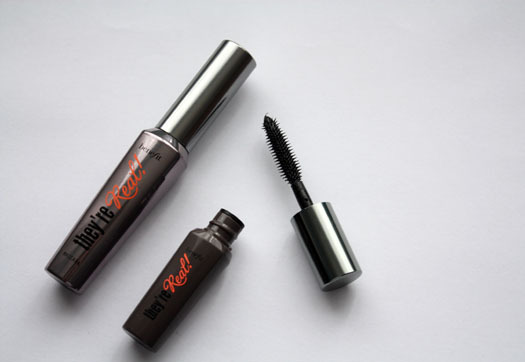 They're Real is designed to; lengthen, volumize, separate and curl the lashes. By horizontally wiggling the mascara wand through the lashes you can amp up the volume. Holding the wand vertically and using upward strokes will curl and separate your lashes. Sound simple? It really is. This mascara is the most smudge proof and it is also easy to reapply during the day. Your lashes aren't left feeling dry. So is They're Real mascara worth the hype? Absolutely! I love this mascara. It really is the perfect multitasker and I'll definitely be heading off to repurchase this in six months time. ♥ They're Real mascara will be available in New Zealand from next month. Thank you so much! It really is a fantastic mascara, well worth the splurge.